Washington Wentworth Sheffield (April 23, 1827 – November 4, 1897) was an American dental surgeon best known for inventing toothpaste. With the help of his son Lucius T. Sheffield, he is also known for being the first person to place the paste in collapsible tubes for public sale. He also made important contributions to the fields of Dentistry and Dental Surgery. He was considered one of the most skilled dentists in New England and the United States. In 1896, Colgate & Company began selling its own toothpaste that mimicked Dr. Sheffield’s ready-made toothpaste and sold it in collapsible tubes like Dr. Sheffield. Later in life, he spent most of his time as treasurer and manager of his companies, the Sheffield Dentifrice Company and the International Tooth Crown Company, in New London, Connecticut. Washington W. Sheffield was born April 23, 1827 in North Stonington, Connecticut, the third of eight children of the Rev. John Sheffield and Eliza (Lewis) Sheffield who married Feb. 6, 1820. Dr. Sheffield could trace his ancestry to Amos Sheffield, who was part of the Winthrop colony in 1630, and back to Edmund Shefield, who accompanied William the Conqueror during the Norman Conquest of England. Dr. Sheffield grew up in North Stonington, Connecticut, and was educated in its public schools. As was the custom in the 18th and early 19th century, Dr. Sheffield began his career in 1850 training as an apprentice dentist with Dr. J. A. G. Comstock of New London, Connecticut. He furthered his dentistry education in New York City by working under Dr. Charles Allen and Dr. D. H. Porter. In April 1852, Dr. Sheffield moved to New London, Connecticut and began a long and successful practice in dentistry and dental surgery. Dr. Sheffield became one of the most successful dentists and dental surgeons in the United States. Dr. Sheffield graduated, in 1865, from the Ohio College of Dental Surgery, the first dental school in the United States, as a Doctor of Dental Surgery. In 1866, Dr. Sheffield received a naval commission from the President of the United States, Andrew Johnson, as a dental surgeon. Dr. Sheffield married Miss Harriet P. Browne, daughter of Richard and Julia Browne of Providence, Rhode Island. This marriage produced one child, a son, Lucius T. Sheffield (May 28, 1854 – September 20, 1901). Lucius Sheffield grew up in New London, Connecticut, and attended Norwich Free Academy. Lucius followed his father into dentistry and dental surgery. Lucius attended Harvard Medical School and graduated from Harvard’s American Academy of Dental Medicine in 1878. After graduation, from 1878 to 1879, Lucius traveled to Paris, France, to study and work in dentistry and dental surgery. Lucius was in Paris watching artists prepare their paint palettes when he realized the collapsible tubes they used to squeeze paint onto palettes could be used to squeeze his father’s toothpaste onto a toothbrush in a sanitary manner. Human beings recognized long ago the relationship between clean teeth and tooth decay and dental disease. The desire for clean teeth led individuals and later doctors and dentists to create teeth cleaning agents and tools. Tooth picks, toothbrushes and tooth powders were early inventions designed to satisfy the need to clean teeth. These cleaning agents for the teeth were often sold by doctors and early druggists. Tooth powder was popular up to World War II. Dr. Sheffield joined many doctors and dentists in formulating his own tooth powder for use on his patients and later as another product for his dentifrice company. Early in Dr. Sheffield’s dental practice, he formulated a mouthwash, which he used for years on his patients. When he and his son started the Sheffield Dentifrice Co. in 1880, they improved and reformulated that mouthwash and sold it as “Sheffield’s Elixir Balm” for the gums. Based on contemporary news reports at the time, Dr. Sheffield conceived of a ready-made tooth crème in the mid-1870s and was using it on his patients with great praise from them. To this crème, he added various extracts of mints that left a very pleasing taste in the mouth of his patients, which caused them to request samples of the toothpaste. Dr. Sheffield shared his toothpaste formula with his son who was a dentistry student at Harvard during this period. The oldest surviving toothpaste record within the Sheffield Pharmaceuticals’ archives, the successor to the Sheffield Dentifrice Co., is a notebook formula of the son, L.T. Sheffield, from 1878. 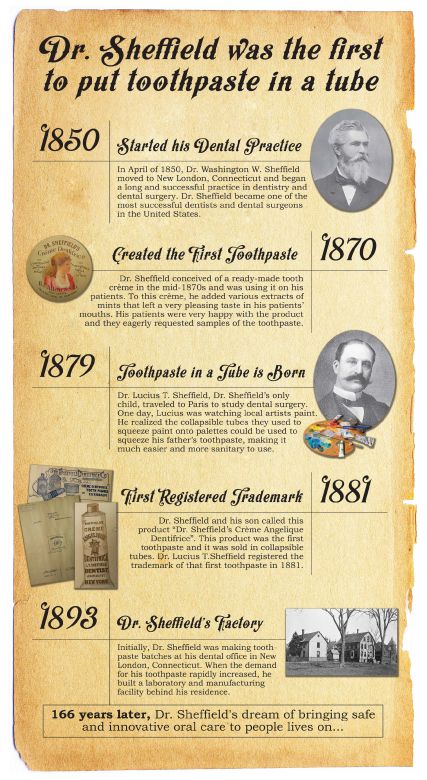 In response to toothpaste demands from patients, Dr. Sheffield started a manufacturing company, in early 1880. Initially, Dr. Sheffield was making toothpaste batches at his dental office at the corner of State Street and Green Street in New London, Connecticut. Demand rapidly grew and he was forced to build a laboratory and manufacturing facility behind his residence. The Sheffield Dentifrice Co. started producing his mouthwash and an entirely new product. Dr. Sheffield and his son called this product “Dr. Sheffield’s Crème Angelique Dentifrice”. This product was the first toothpaste and it was sold in collapsible tubes. Dr. Sheffield’s son, now a Doctor of Dentistry, registered the trademark of that first toothpaste in 1881. The first advertisement ever published for toothpaste appeared on March 12, 1881 in the New London Telegram. The largest druggist in New London, at the time, was Nichols &amp; Harris. The accounting ledgers from Nichols &amp; Harris for the dates Dec. 25, 1880 to Oct. 26, 1881 have survived (Private Collection). They show two of the earliest surviving records of the sale of the Sheffield’s toothpaste in a tube. Dr. Sheffield’s Laboratory, circa 1893, the modern day Sheffield Pharmaceuticals is located at that same site. Dr. Sheffield’s Lab, circa 1893- On March 7, 1882, a newspaper reporter for the largest newspaper in New London visited Dr. Sheffield at his laboratory on Broad Street in New London, Connecticut. The report of that visit was published on March 8, 1882, in The New London Evening Telegram newspaper. The reporter describes the innovations Dr. L.T. Sheffield employed to get the “Crème Angelique” toothpaste into collapsible tubes. New London Evening Telegram, March 8, 1882, describes toothpaste being packaged in tubes. In 1886, Dr. W.W. Sheffield revised the original “Crème Angelique” toothpaste formula. He called the revised formula “Dr. Sheffield’s Crème Dentifrice” toothpaste. This revised formula remained in production years after Dr. Sheffield’s death in 1897. After 1900, the Sheffield Dentifrice Co. became a contract toothpaste manufacturer for many individuals and companies and has remained so to the present day. From 1880 to 1892, the Sheffield Dentifrice Co. purchased collapsible tubes to package the toothpaste. Beginning in 1892, the company started manufacturing its own collapsible tubes by purchasing tube manufacturing presses and fabricating its own tube-making machinery. In 1900 the dentifrice company started a new company called the New England Collapsible Tube Co. This was the fourth collapsible tube manufacturer in the United States. During his career, Dr. Sheffield worked at the cutting edge of dental prosthetics. He specialized in dental bridges and tooth crowns. On May 26, 1885, Dr. Sheffield was granted patent No. 318,581 for a dental bridge to hold multiple crowns together on broken or decayed teeth. During that same period, Dr. Sheffield’s son, L.T. Sheffield, DDM, received eight patents for various types of artificial dentures. In 1886, Dr, Sheffield and his son formed the International Tooth Crown Company. Lucius T. Sheffield, DDM was president and Dr. W.W. Sheffield was treasurer. This company purchased the crown patents of two prominent dentists, Dr. James E. Low and Dr. Cassius M. Richmond. All these crown and bridge patents were combined under one company, which the two doctors advertised as Dr. Sheffield’s Perfect Crowning System. Dr. Sheffield and his son received royalties from dentists around the world when they employed crowns and bridges covered under the Sheffields’ patents. Our Dr. Sheffield's Certified Natural Toothpaste AR APP earned second place for Chairman's Choice at #HBW18. Try both for yourself today! Text 1850 to 28594 to download the app and to view special offers, available nationwide at CVS Pharmacy . 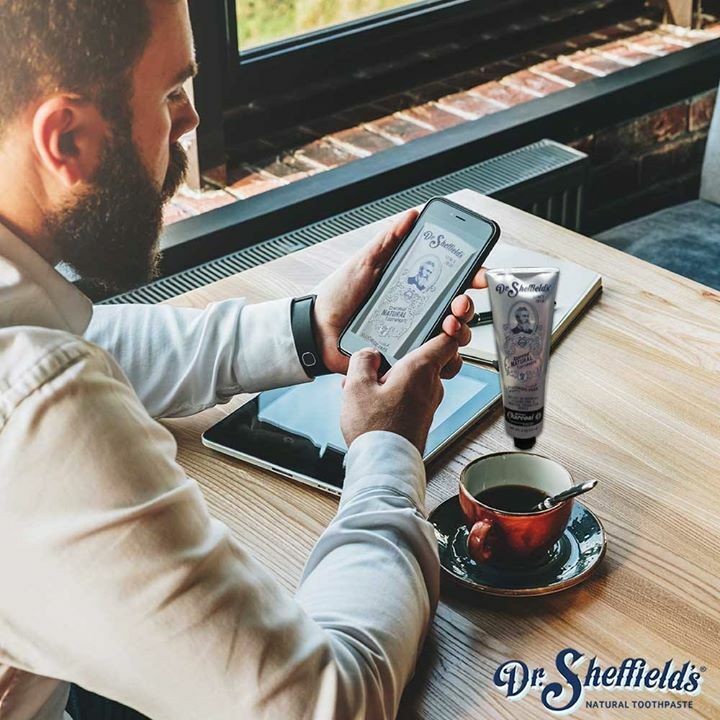 Takes a minute to get the app and sign up for a free sample of Dr. Sheffield’s natural toothpaste. you have nothing to lose except your teeth. It's not just an awesome App, it's awesome product try both today! 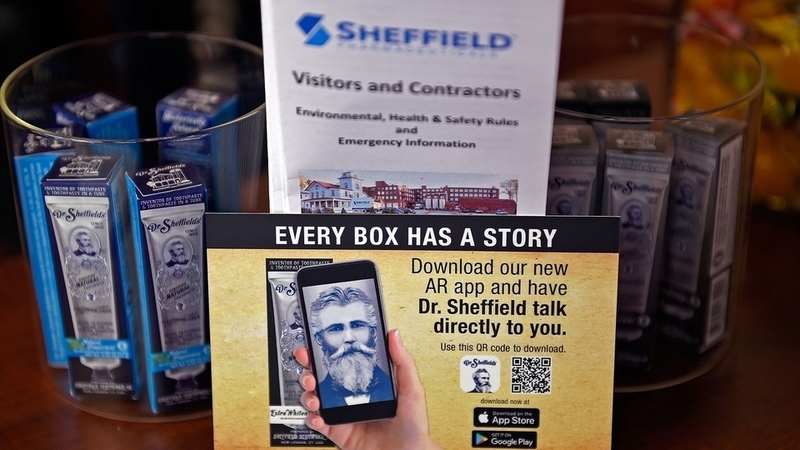 Ever wondered what it takes to create an augmented reality app?